Air Zonk (Jp: PC電人／補完○／クリア× – En: PC Denjin Punkic Cyborg) is a side-scrolling shooter released for the PC Engine/TurboGrafx 16 video game consoles in 1992 and was developed by Red Company and published by Hudson Soft. 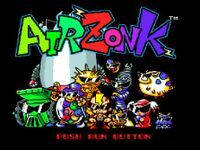 Air Zonk was an attempt to update the company's image via a modern, punkish character called Zonk, who bears a purposeful resemblance to the Turbo's caveman mascot, Bonk. Air Zonk is similar to other scrolling shooters, but what sets it apart are the large number of power-ups and companion characters. Artistically the game is typically light hearted, featuring humorous bosses such as a sentient garbage heap and an anthropomorphic boat. The gameplay centers around the effective use of shooting and bombing to complete a stage. At the start, the player must pick a companion character to team up with to perform special attacks. Air Zonk takes on the distinct visual style that is sometimes called "cute 'em up". There are three difficulty levels: sweet, spicy, and bitter. Source: Wikipedia, Air Zonk , available under the CC-BY-SA License.